Tub Tub was pinched from the Montmouth County Society for the Prevention of Cruelty to Animals' Eatontown shelter around noon on Sunday. Brian Thompson reports. 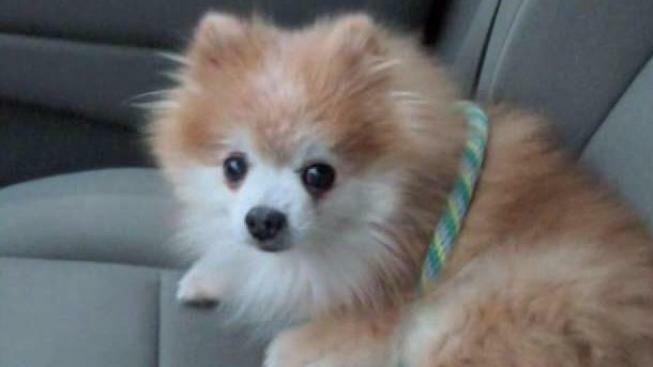 A 9-year-old Pomeranian slated to be a mother's only Christmas gift for her 5-year-old twin girls was stolen from a New Jersey shelter the day before, and advocates are now offering a $500 reward for information that brings the pup home. "I'm very heartbroken over the situation," said Domonique Searight, the mom who intended to gift her twin daughters the 9-year-old pup named Tub Tub. "It's their Christmas present. Instead of looking around for other things, this was my only plan. I thought the dog would be enough." But Tub Tub was pinched from the Montmouth County Society for the Prevention of Cruelty to Animals' Eatontown shelter around noon on Sunday, the Monmouth SPCA says. Tub Tub lived in the kennel just a week since being surrendered by its owner in South Carolina, who could no longer care for him. It's not clear who stole the dog, but the SPCA said Tub Tub's microchip was reported stolen. The agency is checking its cameras to see if the dog-napper was caught on camera. "I just can't believe that someone would come in and actually take an animal," said Searight. "We've never had a theft of a dog ever out of our building, or any animal," said Ross Licitra, executive director of the Monmouth SPCA. Officials don't have locks on the outside doors at the kennel, since there are so many volunteers and staff walking the dogs in the backyard. And there's no lock on the inside kennel doors, in case of a fire. Still, security will now be reviewed, Licitra promises. "We will look at it very carefully and make the right decisions," he said. Anyone with information about Tub Tub or his captor should call the Eatontown Police Department at 732-542-0100. The SPCA is offering a $500 reward.